At the beginning of the game, the city is nothing but a small village. Apart from special buildings (an inn, a stable,...), there are only a few resource buildings (a farm, a sawmill, a quarry, �), a small marketplace and carpenters who can build wooden buildings. However, players have to develop the economic activity along the road, because huge resources are needed to build the castle. They must therefore install better production sources, and maybe find a mason who will help them build stone buildings, or even reach that remote gold mine� But those things are very expensive, and the master builders will have to watch their purse carefully! Indeed, every time a worker goes to work, his master must pay him. Moreover, if his master sends him to work in another master's building, the latter will gain prestige. To win the game, you must take advantage of the other players' resources without uselessly giving them an advantage. Slowly but surely, the village is developing into a town. Old production buildings are becoming obsolete, unless the lawyer transforms them into residential buildings, whose rent brings you additional income. If an architect enters your service, you may embellish the city with some prestige buildings (a statue, or even a cathedral). But of course, master builders do not lay down the law in town; they must abide by the orders of two royal agents: the bailiff and his assistant, the provost. The castle is composed of 3 sections: a dungeon, walls, and towers. The bailiff's movement along the road determines the advance of work in the castle, and the shift from one section to the other. By advancing quickly (and well!) in the building of the castle, the masters accumulate prestige. If you are shrewd, you will also be able to gain the King's favor! At the end of the game, each player adds up the prestige points they have earned since the beginning. The master who has the largest number of points wins. His future at the King's service will be glorious! The game is divided into turns. Each turn is divided into 7 phases. - 2 deniers if they have built the Hotel. The income a player may get is not limited. e) put a worker in the castle. Phase 2 lasts until all the players have passed. Putting a worker on a prestige building (blue), on a residential building (green) or on an unbuilt space is forbidden. Placing a worker on a space where there already is another worker is also forbidden, except in three cases (stable, inn, castle - see below). Passing is free, but placing a worker costs some deniers. If a player wants to pass or must pass because of a lack of workers or money, they put their color marker (located on the bridge) on the first available space (that is, on the smallest unoccupied number) of the passing scale. The first player who passes gets 1 denier from the stock immediately. Once a player has passed, they can't place workers until the end of the phase. The player gives the stock a sum of money that is equal to the smallest unoccupied number on the passing scale (between 1and 5 deniers according to the number of players who have already passed). Then, the player places one of their workers on the space of a special / neutral / basic building of their choice. If the worker is placed in the stables, the player puts him on the smallest number available. Up to 3 workers can be placed in the stable, but a given player can place only one. If the worker is placed in the inn, the player puts him on the circle on the left. As a consequence, this worker will possibly spend some time with another worker placed on the other circle on the right (one player may have two of their workers in the inn simultaneously). The player who places the worker gives the stock a sum of money that is equal to the smallest unoccupied number on the passing scale (between 1 and 5 deniers according to the number of players who have already passed). Then, the player places one of their workers on the opponent's building of their choice. The owner of the building instantaneously earns one prestige point. The player pays 1 denier to the stock. Then, the player places his worker. NB: Placing a worker in one of your own buildings does not yield a prestige point. The player gives the stock an amount of money that is equal to the smallest unoccupied number on the passing scale (between 1 and 5 deniers according to the number of players who have already passed). Then, the player places the worker on the castle space with the smallest number available. put his worker on another player's building, the latter immediately earns 1 prestige point. If the player does not want to move his worker (or cannot do it), they just get their pawn back. The player takes 3 deniers from the stock and gets the worker back. The castle may contain several workers, but each player can only place one. The player may choose to move the provost 1 to 3 spaces backward or forward along the road. The player then gets the worker back. 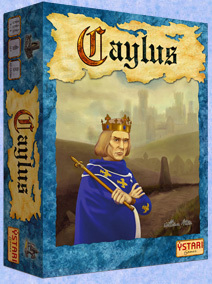 The player may choose to give the stock 1 denier and 1 cloth cube in order to get a royal favor (see below). The player then gets the worker back. NB: You cannot pay 1 denier and 1 cloth several times to gain a favor more than once a turn. The turn order changes: if a player places a worker on circle 1, they become player number 1; the second circle grants you rank 2; the third circle grants rank 3. The other players' positions are changed accordingly on the turn order scale. Then, the players get their workers back from the stable. worker hasn't been driven out (that is, if nobody has played in the inn during this turn), they can either get the pawn back or leave it where it is for the next turn. If the pawn is not removed, its owner will still be able to use the power granted by the inn in the next turn. Following the passing order of phase 2 (that is, the first player who passed speaks first), the players now have the opportunity to move the provost. The latter's final position will determine which buildings will be activated. to move the provost has come. The provost can neither go backward to the area before the bridge (that is, to the special buildings), nor go beyond the last space of the road. The provost can move to empty spaces. When each player has spoken or passed once, move on to phase 5.
prestige points granted by these workers are not canceled). A player doesn't have to apply the effect of a building, unless it is a production building. Once a building has been activated, the player gets their worker back, and the next building is activated. These buildings allow the player who activates them to take cubes from the stock. The cubes are placed before the player. Furthermore, if a stone production building (gray background) is activated by anyone but its owner, the latter takes one resource cube (chosen among the resources produced by the building) in the stock. If the building is activated by its owner, the latter takes the normal income granted by the building, but no additional cube. They allow you to build new buildings on the board: - the carpenter allows you to build wood craft buildings only (tiles with a brown background). - the mason allows you to build stone craft buildings only (tiles with a gray background). - the architect allows you to build prestige buildings only (tiles with a blue background). his houses on the top left corner of the tile. The player immediately scores the number of prestige points for the construction of this building (the number of prestige points is shown in the top right corner of the tile). - the monument: the player who builds the monument immediately gains 2 royal favors (see below). NB: Whenever a player's building is transformed, it goes back into the stock and can consequently be rebuilt. Neutral buildings are permanently discarded. The number of residential buildings available is theoretically limitless. If you run short of them, you can put your houses on empty spaces instead. The lawyer can't transform a prestige building, a basic building or a residential building. Furthermore, the lawyer can never be transformed. If there is a worker in the building the player wants to transform, the latter pays immediately, but the lawyer's action will be delayed until the building has been activated. - the statue, the theater, the university: the builder immediately gains 1 royal favor. Marketplaces allow you to sell 1 cube to the stock and get deniers in return (the price depends on the market). It is not allowed to sell several cubes at once. For a few deniers, pedlars allow you to buy 1 or several cubes from the stock. They don't allow you to buy gold. At the basic (fixed) pedlar's shop, you can't buy more than 1 cube. The non-basic pedlar (the wood building) allows you to buy 1 or 2 cubes of your choice. The church allows you to exchange deniers for prestige points. The player can either pay 2 deniers and get 3 points, or pay 4 deniers and get 5 points. NB: The player who builds this building gains 4 prestige points and a royal favor (see below) when he places it on the board. - the Dungeon (composed of 6 parts) is built before the first count. - the Walls (composed of 10 parts) are built before the second count. - the Towers (composed of 14 parts) are built before the third and last count. The players must build the castle according to their order on the castle scale (beginning with space 1). The player decides during their turn how many batches they will give the stock. A batch must be composed of three different cubes, one of which must be a food cube. The bank allows you to exchange deniers for gold cubes. The player can either pay 2 deniers and get 1 gold cube, or pay 5 deniers to get 2 gold cubes. The alchemist allows you to exchange cubes for gold. A player can either pay 2 cubes (of any good) and get 1 gold cube, or pay 4 cubes (of any good) and get 2 gold cubes. This phase only concerns those players who have placed a worker in the castle. The church allows you to exchange deniers for prestige points. The player can either pay 2 deniers and get 3 points, or pay 4 deniers and get 5 points. NB: The player who builds this building gains 4 prestige points and a royal favor (see below) when he places it on the board. The tailor allows you to exchange cloth cubes for prestige points. The player may either choose to pay 1 cube and get 2 points, or to pay 3 cubes and get 6 points. start building the next section (nevertheless, if the players are building the Towers � which are the last section � it is possible that some of them will not be able to give batches). Finally, the construction of a new section may begin before the previous one is finished (there are still free spaces left). In this case, the spaces will remain unoccupied until the end of the game. - for each batch they provide to build the Towers, the player gains 3 prestige points. Finally, you determine which player has provided the most batches during this turn (in other words, which player has placed the most houses). This player immediately gains 1 royal favor (see below). If several players are tied, the one who arrived first gains the favor. The players now get their workers back from the castle. will only be one count per section). Then, a new turn begins.